High-content analysis assays, whether everyday assays using fixed cells or more advanced applications using live cells or complex models, can reveal deep biological understanding - but only if you’ve got the sensitive imaging and intuitive data analysis technology to uncover it. The Operetta CLS™ high-content analysis system from PerkinElmer features a unique combination of technologies to deliver all the speed, sensitivity, and resolution needed to reveal fine subcellular details quickly and efficiently. At the core of the Operetta CLS system is a light path that ensures efficient excitation of samples and careful collection of emitted signals. The compact 8x LED light source allows the optimal wavelength for each fluorophore to be chosen and delivers the power directly to the cellular samples. User-accessible emission filters enable further optimization of detection. With the stable LED light source, optional temperature and CO2 control, live-cell assays can be run reliably with users safe in the knowledge that the changes seen in the sample are due to the biology, not the technology. Proprietary automated water-immersion objectives with very high numerical aperture deliver and capture more photons and provide a higher resolution in XYZ than conventional objectives – in fact, they capture up to four times more light than high numerical aperture air objectives can. 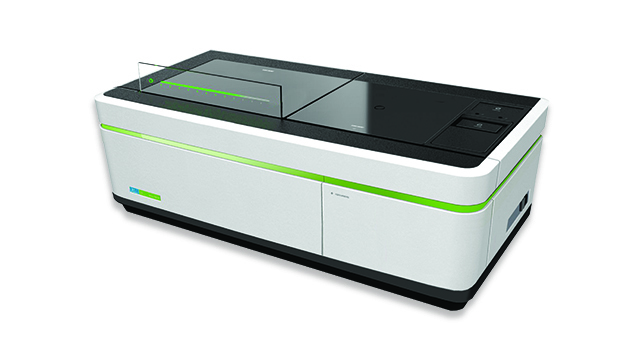 The Operetta CLS high-content analysis system’s proven spinning disk technology minimizes photobleaching and phototoxicity, and provides several advantages over conventional confocal microscopy techniques: Since multiple points are collected simultaneously rather than by scanning a single point at a time, the imaging process is much faster and gentler, enabling efficient background rejection, live-cell experiments, and 3D imaging. In addition, the large-format sCMOS camera delivers low noise, wide dynamic range, and high resolution – perfect for sensitive and quantitative measurements at short exposure times. 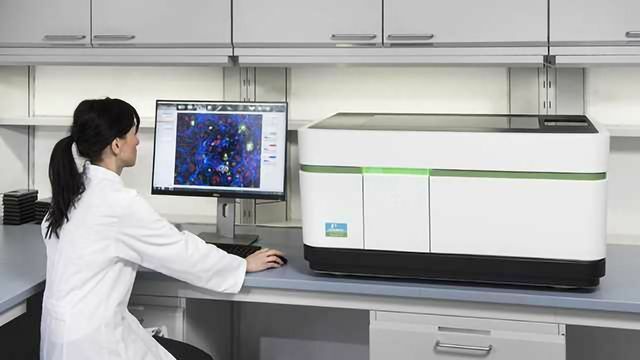 Simple yet powerful Harmony™ high-content imaging and analysis software enables you to set up assays and automate high-content imaging experiments, acquire images and analyze data, and store, retrieve, and present those results in meaningful ways. 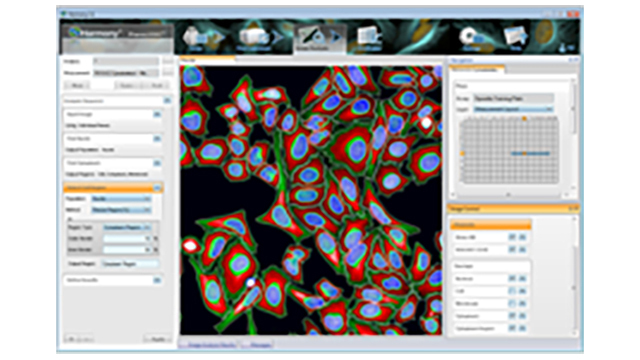 Its workflow-based interface makes the whole process simple and straightforward, even for new users with little microscopy or programming knowledge. A full range of pre-installed, ready-made solutions for common assays get you results quickly, while image analysis building blocks enable you to create, configure, and customize your own protocols. Advanced analysis features give detailed cellular phenotype descriptions for more robust, reproducible classification. High-content imaging assays generate large quantities of data so it’s important that you have the tools to manage it. Harmony allows you to store metadata such as assay layout, instrument settings, analysis results, and user-defined keywords and annotations. With regular upgrades, Harmony you can gather unbiased data from your cell samples and keep you ahead of your growing research needs. Whatever your application, there’s an Operetta CLS system configured to meet your requirements – choose from our range depending on your lab’s needs. As the system is modular, it can change with your research demands. The Operetta CLS system delivers everything you need from high-content analysis – and more. The premier confocal solution for the most demanding high content applications - high-throughput, phenotypic screening and assays using complex and 3D disease models. Easily quantify complex cellular phenotypes with Harmony® high-content analysis software. 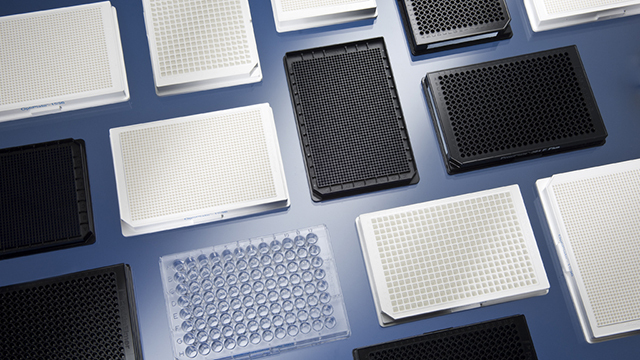 By using a microplate specifically designed for high-throughput screening, you can be more confident you’re getting quality results. See the difference a plate can make.